How do I get reviews from customers? Reviews are one of the most significant ways you can stand out in front of prospective customers. There are two types of reviews that your business can receive on Bidvine: reviews from customers that hire you using Bidvine, and customers that hire you outside of Bidvine. For each type of review, there is a different way to get reviews from customers. All ‘Verified Hire’ reviews about your business can only be made by customers that have hired you through Bidvine. An important first step is making sure you are marked as 'hired' on Bidvine for the projects you have been hired for. To mark yourself as hired simply login to Bidvine, go to the Active Bids section, open the request(s) that you won and click “mark as hired” at the bottom of the request. As soon as you indicate you’ve been hired, we will email the customer asking them to confirm and leave a review. Once you receive a review from a customer that hired you through Bidvine, we’ll send you an email. At this point, if appropriate, you could post a public reply to the review. 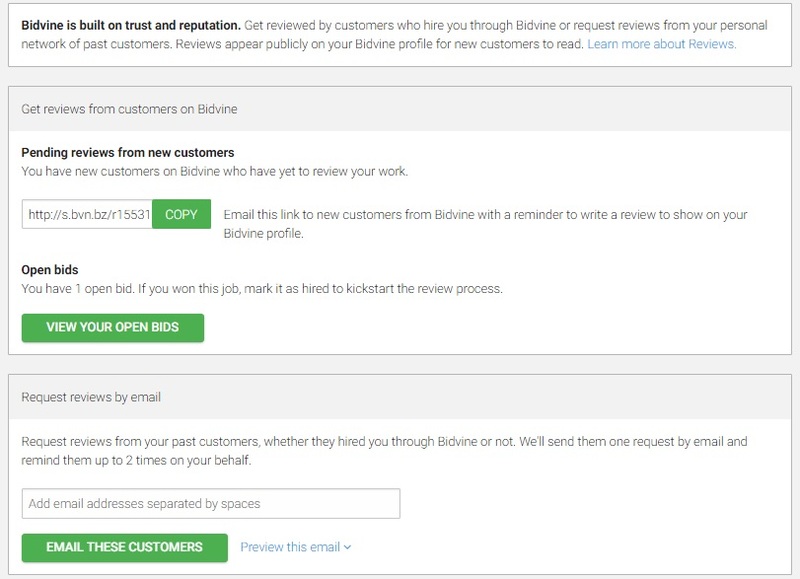 To request reviews from customers that have hired you outside of Bidvine, login to Bidvine and select Settings then go to Reviews. On the Request Reviews page, you will be able to invite customers to leave you a review by email or through social media. You can also choose to copy a link to share with your customers on any platform you wish. Once you receive a review from a customer that hired you outside of Bidvine, we’ll send you an email. As a service provider, you will have the ability to either accept or decline any incoming reviews from customers that have hired you outside of Bidvine. If you decide to decline a request, you can pass your feedback back to the customer and ask them to resubmit their review.